Great new parakeet photos (1/4/06) here, until I incorporate them below. 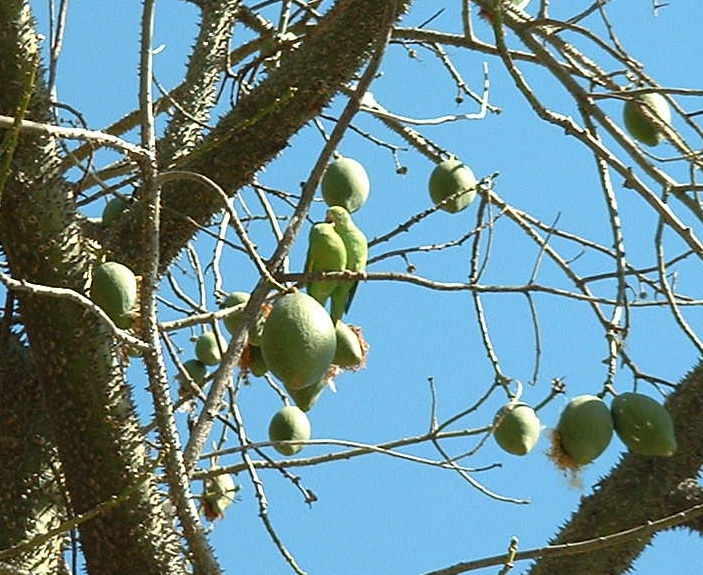 A Yellow-Chevroned Parakeet happily tears into a pod on a Silk Floss tree. This was at Hilgard & Le Conte. Feb 2004. A pair of mates regurgitating into each other's mouths!! This is how birds say "I love you!" Feb 2004. 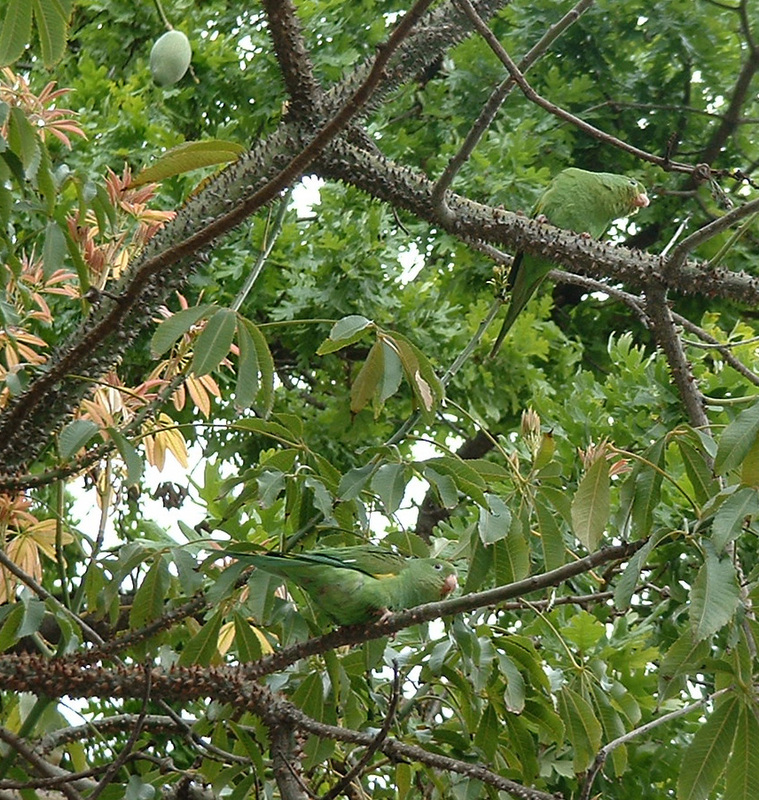 How many parakeets can you spot in this picture? Feb 2004. A curious parakeet perched on a low branch at Hilgard & Le Conte. May 2005. Three parakeets eating in the tall, blossoming Pink Cedar tree in the Botanical Garden, photo taken from East side of Hilgard Ave. Feb 9, 2006. Description: Smallish-Medium. 8-9" in length (beak to tail), larger than a sparrow. Bright light green birds, with wings that are slightly darker green. You'll also see a small patch of yellow on their wings. In flight, you'll see it's actually a yellow band that extends halfway along the wing. They have dark eyes. Their hook-shaped beaks also distinguish them from native wild birds. Sound: Loud, high-pitched, metallic chattering noises in rapid succession. (I think it sounds like the second half of their scientific name: "Chiriri") No recording yet, but I hope to have one soon, with the help of Alex Kirschel. In Veteran Park down by the Federal Building. At the top of the stairs that lead down to the Fowler Museum from Royce Hall. These stair parallel the Jann Steps. There used to be a large Silk Floss Tree next to Campbell Hall, but it was recently torn down (Spring 2005). The parakeets apparently depend on these trees for food, so they hang around the botanical gardens of L.A. where these trees are planted. Every time you go bye one of these trees, take a close look. The parakeets are almost the exact same color as the leaves, so they blend in well and can go unnoticed if they don't happen to be making noise at the time. Also look for bits of cottoney-looking stuff floating down from the tree. 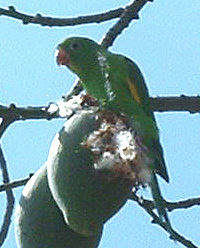 That's a dead giveaway that the parakeets are there, because they dig into the pods with their beaks and pull out the cotton-like stuff. I've also noticed that these birds like to roost (sit) way high up in a tall tree in the UCLA Botanical Garden, which I'ved learned is a Pink Cedar tree. 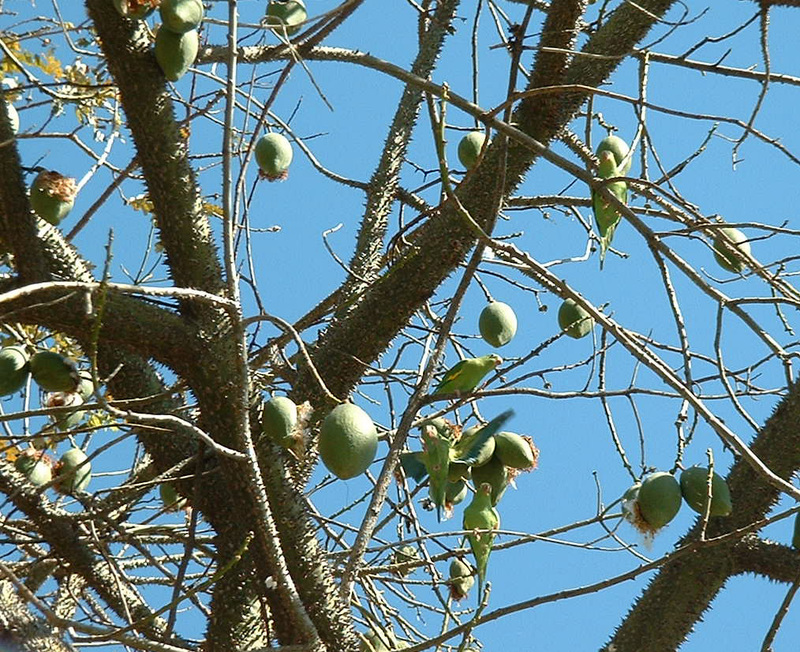 The parakeets only hang out in Silk Floss Trees when they are bearing fruit to eat! I'm not sure when the trees start bearing fruit (it may be as early as sometime in Fall as I'm seeing flowers on them in September), but they can continue to bear fruit into late Spring. Notes: A.k.a "Squeakin' Greenies!" These birds were one of the most delightful surprises for me as I was learning what birds we have around UCLA. I first discovered them when I heard unfamiliar bird noises coming from a tree next to the Janns Steps. 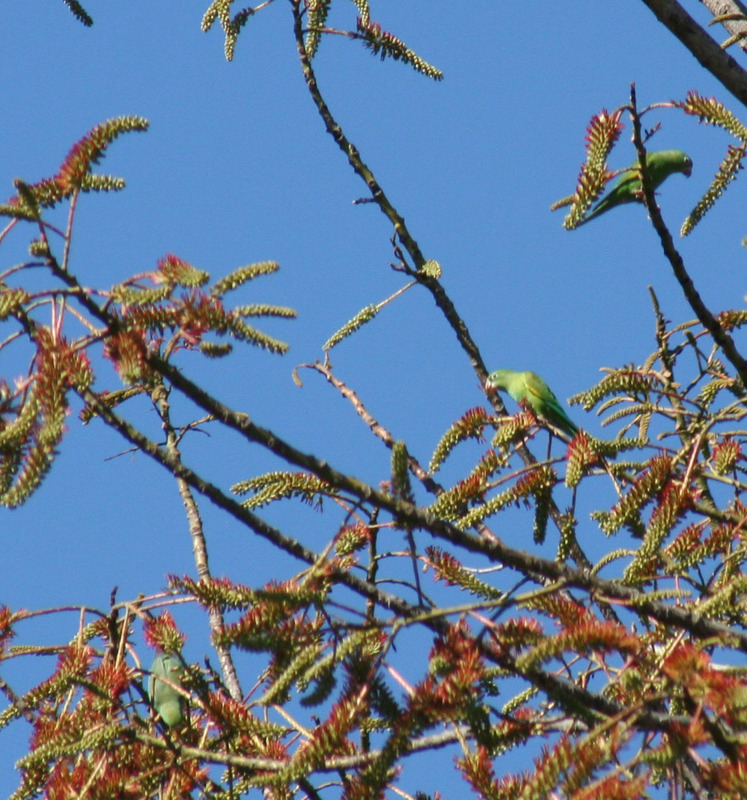 It sounded like a pet shop kind of bird, and then I saw a small green parrot-looking guy in the tree! I was at first dismayed because I though someone's pet bird had escaped, but then I saw the rest of the flock and figured out that these were in fact feral birds! They must have been established from escaped or released birds that were intended for pets. They have adapted to L.A. well enough to persist. They travel in flocks always. I've seen them in groups as small as 2-4 and as large as 20. They are lively and clever little birds and their antics can be very entertaining to watch. Once you know their voice, you'll likely hear them flying high overhead. I hear them flying over the Math Science Quad from tiem to time. Often they fligh so high that you can't see them, but sometimes I can spot them. 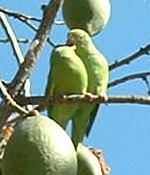 There are a few other species of parakeets and parrots that are established in L.A. See the California Parrot Project. Historical: These guys certainly weren't around when Dr. Loye Miller wrote "Birds of the Campus" in 1947. The feral population of this species probably began in the 1970s, when large numbers of the birds started to be imported from their native South America to be sold as pets. Initial populations were probably established from birds that escaped, either from the crates they were imported in (which were opened for inspection upon arrival), or from owners. A feral population exists in Miami, Florida also. White-Winged Parakeets were initially imported in large numbers, from 1968-1973, prior to the establishment of feral Yellow-Chevroned Parakeet populations. The White-Wings also established themselves in L.A. and Miami, probably as a result of escaping. A majority of the White-Wings were imported from Peru. 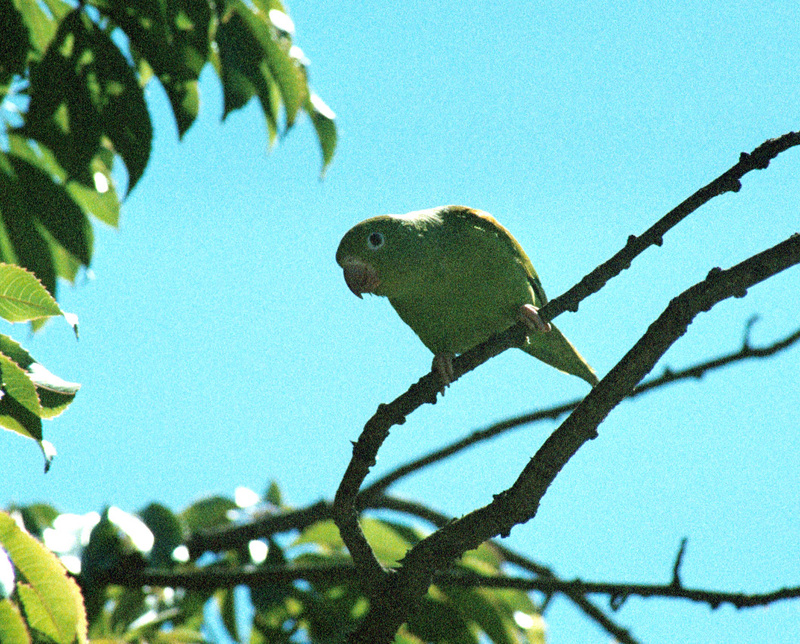 When Peru banned export of those and other birds in 1973, the demand for such pet birds was met by increased imports from other countries, mostly Bolivia, where they have the Yellow-Chevroned Parakeets instead of the White-Winged ones. The rise in the feral Yellow-Chevroned population reflects the increase in importation. The White-Winged Parakeets have declined considerably since the early 1980s while the Yellow-Chevrons have become more established (although there is not much good data on either of these species in the U.S.). 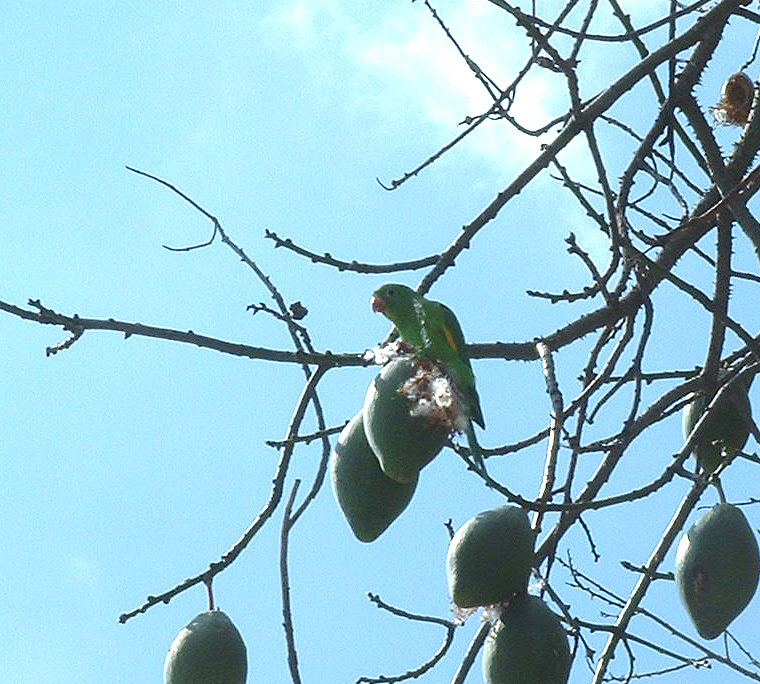 It seems almost certain there no more White-Winged Parakeets in L.A., but there may still be some in Miami. White-Winged Parakeets look very much like Yellow-Chevroned ones, but has a white patch on their wings that's only visible during flight. 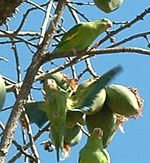 Note that both White-Winged and Yellow-Chevroned Parakeets are sometimes erroneously refered to as "Canary Winged Parakeets." Don Brightsmith estimated the population of Yellow-Chevroned Parakeets at 400 individuals in Los Angeles in 2000. Brightsmith, D. 1999. White-winged Parakeet (Brotogeris versicolurus) and Yellow-chevroned Parakeet (Brotogeris chiriri). In The Birds of North America, No. 386–387 (A. Poole and F. Gill, eds.). The Birds of North America, Inc., Philadelphia, PA. Here is an interesting article on Yellow-Chevroned and Canary-winged Parakeets by Donald Brightsmith from the May 2000 issue of Bird Talk magazine. Western Birds, Volume 28, Number 4, 1997 - the entire issue is devoted to naturalized parrots in southern California. It's not available online, but can be ordered for pretty cheap here.